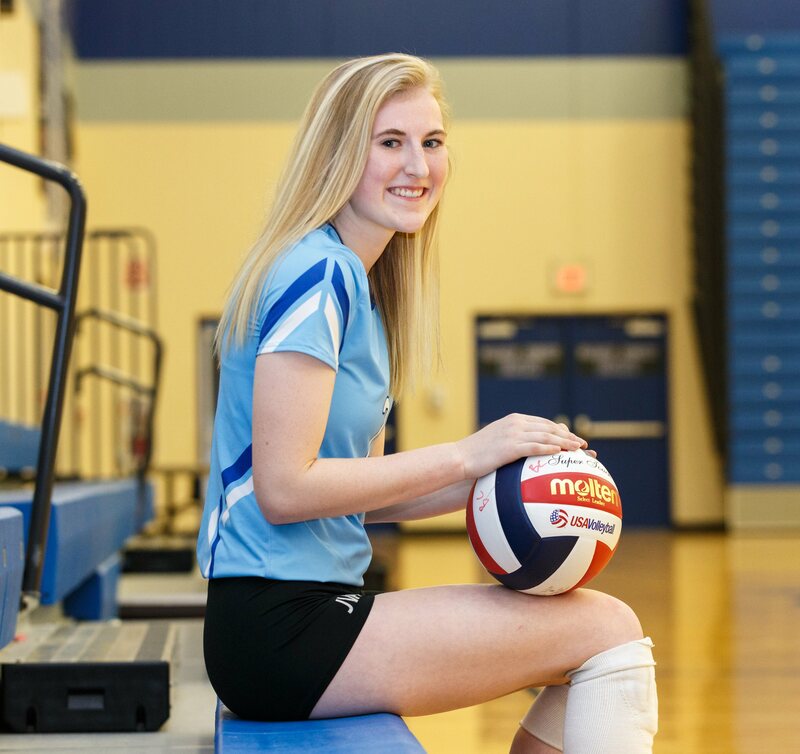 Ever since she first started playing volleyball, Brookfield Central's Miranda Wucherer knew this was what she was going to do. "I like the team aspect of it and how you can do so many things that can impact the game," Wucherer said. "I like the feel of it. From a very young age, I knew this is what I was going to do." Miranda's mom, who passed away when she was 7 years old, and her mom's sisters were really into the sport, as her aunts played in college. "At a young age I was in the gym. I started in fifth grade at St. Joseph's in Wauwatosa. Then I got into club when I was 11. Miranda has done her mother (Wendy) proud, as last season she earned All-State and All-Greater Metro Conference honors and was named GMC Player of the Year, the first Lancer to ever earn that honor. When Miranda was 6 years old she went to the Jr. Lancers summer camps. Later on she was involved in the club volleyball scene and Central Scott Spiess was coaching there. "She came to camp a few times and we kind of knew right away that we had something there," he said. "She had good athleticism and could do a lot of different things." Wucherer (pronounced Wucker) started on the varsity as a freshman and helped the Lancers finish fourth with a 6-3 record in the GMC and 22-16 overall. She broke out as a sophomore, though. "She started as a freshman, she was a little timid coming into new surroundings," Spiess recalled. "It took her a while to get comfortable. She played all the time, but she wasn't necessarily the 'go-to' player that she is today. 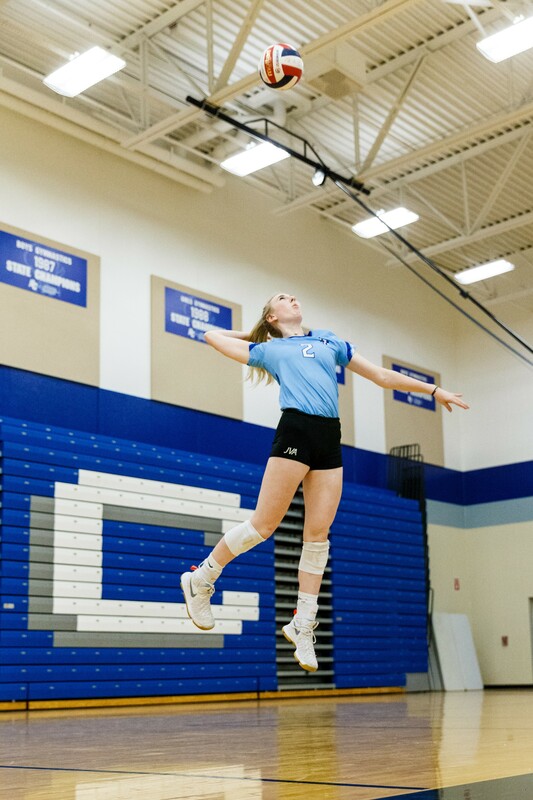 Photo by Alan Herzberg, SportsPhotos LLC --- Senior Miranda Wucherer became the first Brookfield Central volleyball player to be named Greater Metro Conference Player of the Year last year. "But she kind of broke out her sophomore year where she was becoming more offensive from an attacking standpoint as well as her setting was starting to get better and developing more." Miranda earned second team All-GMC honors as a sophomore as the Lancers improved to third place with a 5-2 record and 13-7 overall. The athletic Wucherer splits her time between setter and outside hitter. She talked about the transformation in her game since her freshman year. "When I was a freshman I was just a setter. I wasn't really a hitter at all," she said. "I wanted to be strategic. I wanted to mess up the other team, play mind games. Setting is a completely different mindset. That's what I was doing. "In hitting you're going to score, you not going to set up other people. It's your turn to terminate the ball. You have to get in a different mindset. When I'm in the back row setting, it's all about setting. I have to know 'What are my matchups? What am I doing?' In the front row it's 'Where can I score? Where am I going with the ball.' I'm always looking through the net. I go from offensive hitting (as an outside hitter) to helping my team to go after it (as a setter)." Spiess talked about her versatility. "She has a really strong volleyball IQ," he said. "She really understands the game from both perspectives. I think being able to do both things, helps her in the other. From a setting perspective she knows where to put the ball to help the hitters get in a good position to score. The counterpoint to that - as an attacker she knows what to look for, what spots to hit to place the ball to cause trouble for the defense." Spiess talked about that IQ when asked about her strengths. "She has a great understanding of the overall game and how it can be impacted in so many different ways," he said. "From a physical standpoint - her arm - she's always had a fast arm. Which in volleyball equates to velocity on the ball. Which is then scoring points. With her jump serve and the speed of her attacking arm are something that is quite impressive when compared to other players. We call it 'using it like a whip' and she definitely whips it." Miranda talked about how much her quickness helps her. "If I'm going forward (as a setter) and the middle follows me, I have to go backwards quickly. I have to send the ball in the opposite direction," she said. Photo by Alan Herzberg, SportsPhotos LLC --- Miranda Wucherer was named first-team All-State last season. She also talked about her court vision. "Seeing the court, the other side, but I'm also seeing my side of the court," she pointed out. "Knowing what are their strengths, kind of just breaking down the game as the game goes so quickly. I'm still being able to make those decisions and see the floor." With the rest of the season in front of her and Northern Kentucky University in the future, Miranda knows she has parts of her game to work on. "Every year I feel I can get better, no matter what it is," she said. "I know I'm super athletic and I know that helps me a ton being undersized (5-feet, 9 inches). But I'm always working on all my shots, working on my hand placements. still reading the ball. I feel like one of the biggest things I need to work on is defense because I'm more of an offensive player. "But going to every practice I want to get better at anything I can. I'm trying to soak everything in instead of saying 'Hey, I'm good at this.' I want to get better at everything I can, especially going on to play at the next level." Spiess agreed with his star player about improving her defense. "As a setter she wants to get in there on her second touch," he said. "But there is a ball coming to her the first time and we want her to be able to get the ball up and trust her teammates to make the ball better. She has to think outside of that the mindset. "She's a fierce, fierce competitor, but to be able to keep that cool demeanor. She has to exude that confidence to her teammates, so they have that comfort level that they have one of the best players in the state on their side. It's as if she doesn't get rattled, then they don't get rattled type of thing." "When Scott told me I couldn't believe it. I was in shock," she said of her Player of the Year and her All-State honors. "I was like hoping I would be first-team all-conference. When he told me that and all the accolades started coming out, I was like 'Wow I actually did that.' I never came in actually thinking I would do that. "It showed the hard work and all the practices and how my teammates helped me so much to get to that point. It's a team sport and without my teammates that would never have happened. It was crazy and I was excited it happened and I hope I'll be able to do it again this year." Miranda is one of three captains this year, along with Cami Herman and Sara Ozolins. "Each of our captains bring something different to the table," she said. I'm the one who is going to hold everyone accountable. I lead by example, show hustle and smarts. I hope people can see that in my game. "I try to lead anyway I can. I try to get better as a leader. I've played a lot of positions and I try to help other people on the floor. I'm always trying to learn other people's positions that can help me on the floor." Miranda was asked if all her accolades helped her confidence coming into this season. "It helps a lot, but it also puts the pressure on you because knowing last year I could fly under the radar," she said. "Going into this year I know every team has their eye on me. My confidence is there, I know I can do the things I did. It's like taking every game, game by game, not worrying about the outside stuff, just focus on playing volleyball." Spiess felt it was a positive and talked about her conference honors as well. "Last year we sat in the all-conference meeting and I threw her name in the hat for Player of the Year," he said. "But we finished in fourth place - typically it comes from a player on the first or second-place team. It was almost unanimous from the other coaches in the league. She's a do- everything player. Even the matches we weren't winning she had a huge impact on the match. "Once that happened and she was named first team all-state - those were kids she played with on the club level in the off-season - it did help her confidence that her name was mentioned in the same breath as those other big-time players." FAVORITE MOVIE: 'Remember the Titans' - Sports movies. MOST MEMORABLE MOMENT: Being the first Lancer to win the Greater Metro Conference Player of the Year honor. WHAT DO YOU WANT TO DO IN THE FUTURE: Attend Northern Kentucky University, play volleyball and study sports business.